Mental Illness, Homelessness, Drug Addiction: Do These Sound Like Crimes? Why are we letting these serious social problems be handled by the criminal justice system? Kajieme Powell told the St. Louis police to shoot him. He told them repeatedly to shoot him, and the two police officers who were called to the scene quickly obliged. But they didn’t shoot him because he told them to. The official reason St. Louis Police Chief Sam Dotson gave for why the officers shot Powell—which they did at least nine times, including several shots fired after Powell had already fallen to the ground—was that Powell was carrying a knife and charged toward the two officers holding that knife with an overhand grip. Cellphone video captured by a witness standing nearby throws this official account of events into question, including the overhand grip, whether Powell “charged” at the officers and even the distance Powell was from the officers. But what does seem clear is that Powell was not well. In the video, he paces back and forth outside the store speaking incoherently, the two stolen energy drinks sitting on the sidewalk. The first thing he says that makes any sense is when the police arrive and he yells, “Shoot me!” The police do nothing to de-escalate the situation, hopping out of their car with guns drawn. Perhaps this is protocol, but at no point, after recognizing that Powell is only holding a knife and is not threatening the lives of anyone around him, do they attempt any non-lethal means of subduing him. They do not recognize his barking “Shoot me! Kill me now!” as suicidal. They ended the ordeal, and Powell’s life, without much consideration of any alternatives. But this is to be expected when far too many police officers aren’t being trained to handle suspects with mental illness, but are increasingly called to do so. 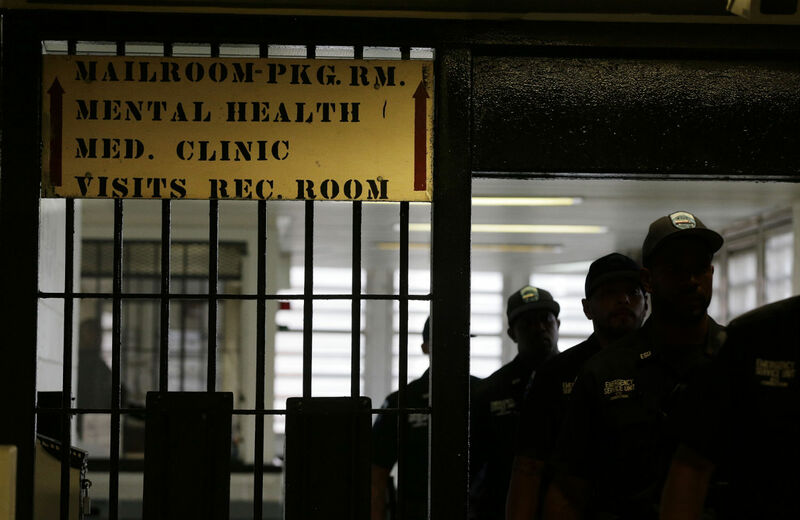 As mental-health services disappear across the country, it is the police departments, the court system and the prisons that, more and more, are charged with care for those with mental illnesses. But that care often takes the form of what happened in St. Louis to Powell, or of incarceration without treatment. This is true for a number of social problems that America would rather not deal with. It’s a system that’s not only unsustainable, financially and morally, but does little to ameliorate these issues. Fortunately, there are alternatives, and in the absence of any national policy shift, America’s cities have been on the front lines of implementing new and better programs that get people the help they need without sending them through the criminal justice system. Still, more can be done. At any given moment in the United States, there are some 2.3 million people who are incarcerated. This country has the highest rate of incarceration in the world. And this persists even as the crime rate has dropped. The main driver of the explosion in prison population (in the 1970s it was somewhere around 300,000—a number prison activists said was too high even then) has been the War on Drugs, which in addition to locking more people up for nonviolent offenses, has led to mandatory minimums and longer prison sentences across the board. While we may lag behind in math and science, we lead the world in innovating new ways to maintain our prison system. This year, we’re launching a new video series, OverCriminalized, that focuses on the people who find themselves being trafficked through this nation’s prisons and police precincts with little regard for their humanity and zero prospects for actual justice. They are victims of an unwillingness to invest in solving major social problems, and the consequent handing off of that responsibility to the police, the courts and the prisons. They are the mentally ill, the homeless and the drug addicted. Sometimes they are all three. When they aren’t killing people with mental-health issues, the police are arresting them, a harrowing and harmful experience in its own right. “Jails are the number-one mental-health facilities across the country,” San Antonio Police Officer Joe Smarro explains in this video series. And that’s no surprise, considering that from 2009 to 2012, $4.35 billion in public mental health spending was cut from state budgets. According to Leon Evans, president of the Center for Health Care Services in San Antonio, nonviolent mentally ill persons are on average incarcerated for three to four times longer than violent offenders without mental illness. And the type of treatment they receive when they are imprisoned is no less violent than what they experience on the street. Ultimately, we are locking people up for either recreational drug use that is harming no one, or for self-medicating an undiagnosed mental illness. In the same way people become addicted to drugs, we have become addicted to using incarceration to treat problems without addressing the underlying causes. The same holds true for homelessness. In New York City, arrests of peddlers and panhandlers—crimes associated with homelessness—are triple what they were only a year ago. Earlier this year, the NYPD came under fire for raiding a homeless shelter, Freedom House, and arresting twenty-two people. In Fort Lauderdale, Florida, city commissioners recently passed an ordinance that prohibits “camping”—or sleeping outside—and carries with it the potential penalty of a $500 fine and sixty days in jail. There is a longstanding history in this country of imprisoning the most vulnerable populations. The criminalizing of homelessness harkens back to the days of post-Reconstruction, when vagrancy laws that had not been enforced for decades were suddenly being applied to the newly freed black populations. The “black codes” targeted the formerly enslaved and arrested them for violations such as not being able to produce paperwork showing employment. The result was their being arrested and shuffled off to prisons that had sprung up on former plantations, effectively re-enslaving them. This legacy has continued in our era through broken windows policing, stop-and-frisk policies and discriminatory immigration enforcement measures such as Secure Communities. All of these have the potential to criminalize everyday behaviors (often based on race) and maintain police officers’ role as the preferred tool to address too many of society’s problems. What the homeless need is housing, first and foremost, and prison is not an adequate substitute. “So many major social problems come to the criminal-justice system to be fixed because there isn’t something else out there. But don’t ask the criminal justice system to do it all, because the only thing we really know how to do is send people to prison,” prosecutor Dan Satterberg told our film crew. That’s why this video series is not just about presenting the problem, but about how you can take action. The criminal-justice system is racist and corrupt. Mass incarceration creates more problems than it solves. Prisons are more violent and expensive than the alternatives. The entire system is less humane that it should be. These videos focus on solutions that are not only cost effective but actually work in bettering people’s lives and making us less dependent on prisons. These programs could certainly go further, by more effectively keeping these social problems out of the criminal-justice system. But they go a long way toward rethinking the efficacy of treating homelessness, drug addiction and mental illness as nails that can be hammered down simply with more arrests. These approaches save money and save lives. But implementing them in more of our communities will take a concerted political effort. As a first step, you can sign this petition calling on Congress to pass the Strengthening Mental Health in Our Communities Act. A better way is not only possible, it’s necessary. It’s Time for the NYPD to Stop Treating Mentally Ill New Yorkers Like Criminals: How a crisis intervention program pioneered in Memphis could save lives and prevent arrests. What Happens When A City Decides to Offer Addicts Services, Not Prison Sentences? Inspired by Seattle, Santa Fe adopts the LEAD program to divert people arrested for drug possession away from the criminal justice system and into treatment. Can a ‘Homeless Bill of Rights’ End the Criminalization of LA’s Most Vulnerable Residents? After years of harassment by the police, homeless Angelenos and their allies fight back.